I can’t say that it all went without a hitch! 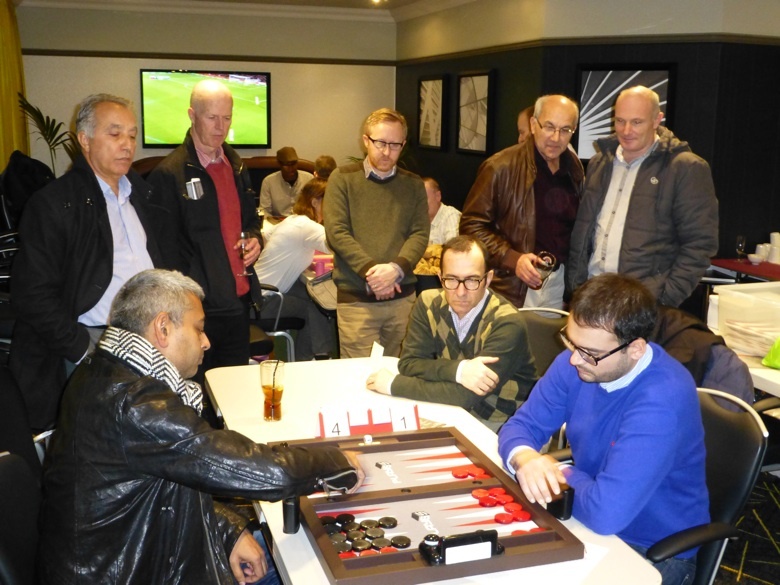 However that didn’t stop 51 players making the most of a great day in the comfortable surroundings of the newly refurbished Victoria Casino in London’s Edgware Road. 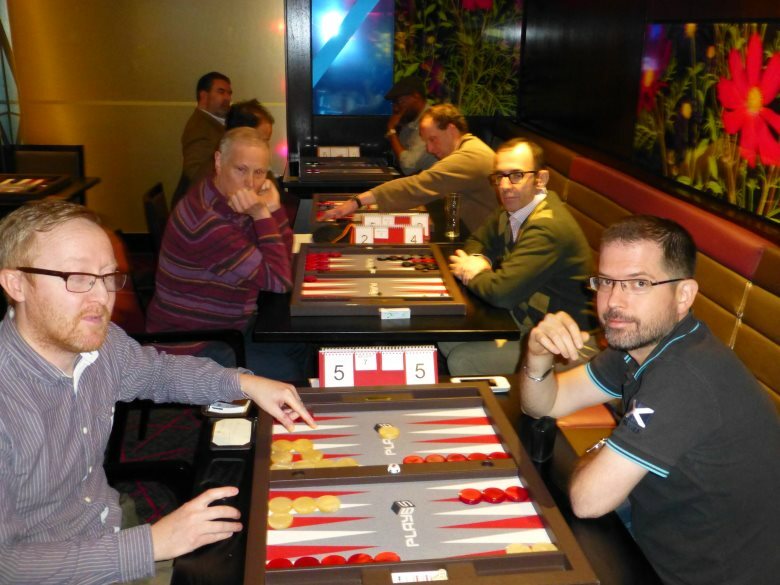 We had gathered here for the second of the 2014 UK Open Qualifiers on Saturday 22nd February. Before I go any further, I will present you with several positions to ponder. These are all from one of the semi-finals, with a couple of variants included. Unlike the protagonists in the match, you will have the luxury of being able calmly to ponder these without pressure, in an atmosphere devoid of all excitement and emotional stress. All matches in the qualifier were to 7 points. White on roll leading 2-0 to 7. Cube action? Brown on roll owning a 2-cube, cube action? Answers given later in the article! A number of things conspired against us to delay the start of the tournament by almost half an hour but, once under way, everything went reasonably smoothly. For most of the afternoon we had the use of both the restaurant (which only opens in the evening) and the VIP Poker Room. This gave us ample space, but sometimes I felt like I was on elastic as I oscillated between the two areas. I am extremely grateful to my non-playing assistant Ros Nathan, without whom my job would have been much harder. As players were eliminated from the main flight some wandered off to play poker; for those who wanted more backgammon there were several 8-player jackpots. 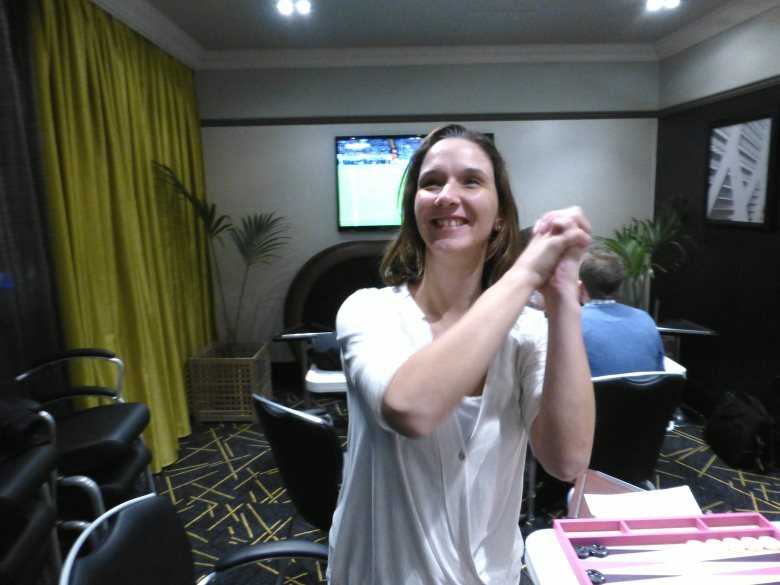 Roxy reaches the final of a Jackpot! Unlike the Brighton qualifier, where there wasn’t a single ruling request, at the Vic I was summoned on several occasions. Some queries related to the ‘legal moves’ rule, but none could be described as a dispute; clarification would be more accurate. One incident related to an incorrect setup at the start of the game with one player erroneously having placed three checkers on his opponent’s acepoint. I was glad I had recently checked this in the rules and remembered that a correction can be made up to the point where four moves (two each) have been completed. One ruling request was from Simon Barget, in his third round match against the less-experienced Joe Assheton. Joe, leading 6-4 Crawford and in a fairly commanding position, had rolled a double 2 but had inadvertently misplayed – moving a mixture of 2’s and 3’s – when a much better legal move was available. 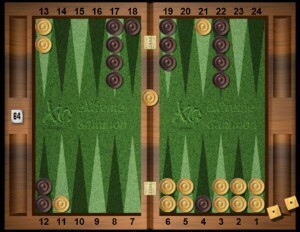 Commendably, and because he was unsure of the rule himself, Simon sought a ruling which subsequently enabled Joe to replay the move legally and could easily have cost Simon the match. 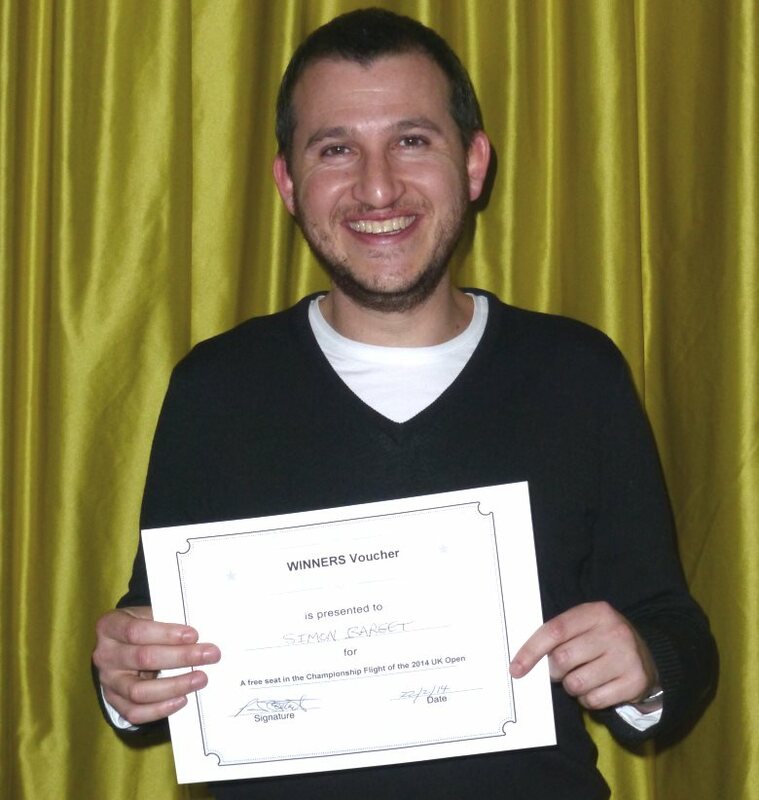 Simon was rewarded for his fair play with some good dice which eventually landed him in the quarter-finals and later in the semis. 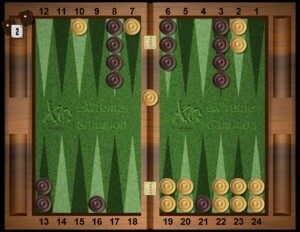 The positions shown earlier were from Simon’s semi-final match against Jason Pack. 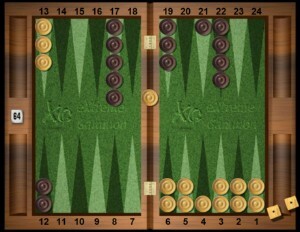 Jason was leading 2-0 to 7, when the sequence began. In Position 1, Jason (White) has 14 shots from the bar to hit Simon’s blot. If hit, Simon (Brown) could easily find himself at the wrong end of a 6-0 scoreline. However, when Jason misses, Simon has good chances of covering his home board blot, or attacking, or simply winning the race. 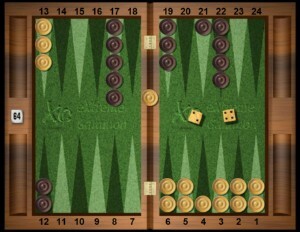 Jason decided not to double in the hope that he would be able to give Simon a more difficult decision later, and proceeded to roll a 42. After the hit B/21*, the 2 presents another interesting dilemma: whether or not White should lift the blot on his own 4-point. Playing 13/11 (as Jason did) gives the equivalent of a direct number (all 7’s and 9’s) to cover next time if not hit back immediately. Simon’s weak two point board, his ugly distribution, and the extra gammons won after leaving the slot make this play look right….and it would have been with the cube already turned (Position 2b). However, because Jason still has cube access, a smaller play is called for and lifting is correct (Position 2a). I presume that many of the extra gammon wins claimed by XG (over 16% more!) never materialise when the cube is centred because they apply to games played to a conclusion. In practice, many games will be ended by a cube turn. After Simon came straight back with 41 (21*, 7) Jason had another cube decision. Once again White has 14 shots (when you count the 11 and 22 switching plays) but Simon’s second blot results in more gammon losses. This time the double is clearer and the take is scarier, but still correct (Position 3). Jason cubed; Simon decided that the glass was half full rather than half empty and correctly took, then Jason entered and hit with a devastating 1-6. However Simon proved that he could be deadly accurate with ‘the fours’ apparently on his side. He found one on each of his next few rolls, in the process sending several more of Jason’s men back. This leads to Position 4(a). Everything about this position screams ‘recube’! Brown owns a 2-cube, trails in the match, and every number except 55, 52 and 44 puts at least one more enemy checker on the roof with (if the 4-cube is taken) match-winning gammons a-plenty. On the other hand, White does have an anchor to fall back on and he still has that powerful five point board should he manage to hit something during the blood-bath which is likely to ensue. Obviously this can happen, and in the heat of battle it can be difficult to give up a game in which one had a commanding position just a roll or two earlier. For money , 4(b), this is a marginal redouble at best and an easy take but the match score makes a huge difference: Jason’s own gammons are devalued and the 4-cube will be virtually dead. This turns it into a monster pass. 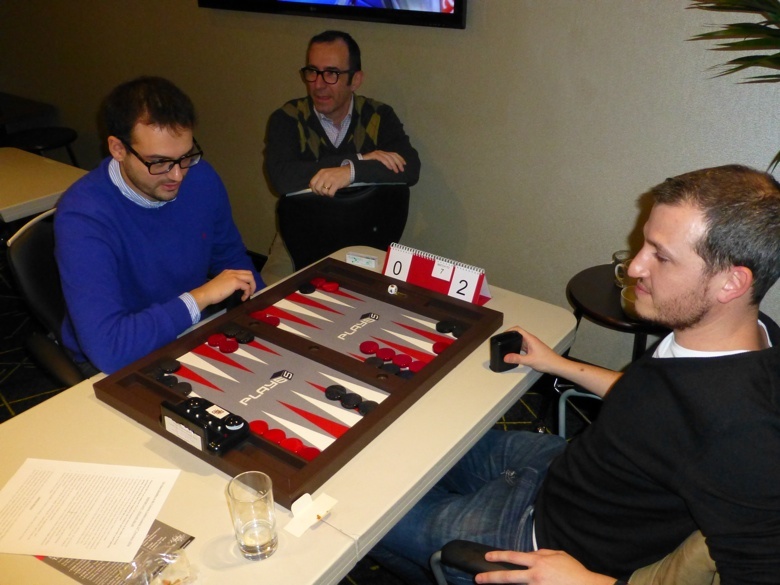 Simon redoubled and Jason took, perhaps seduced by the prospect of going up 6-0 (or better!). He later established a 2-5 backgame, missed a double shot as Simon was bearing in, and lost a single game to go 4-2 down. 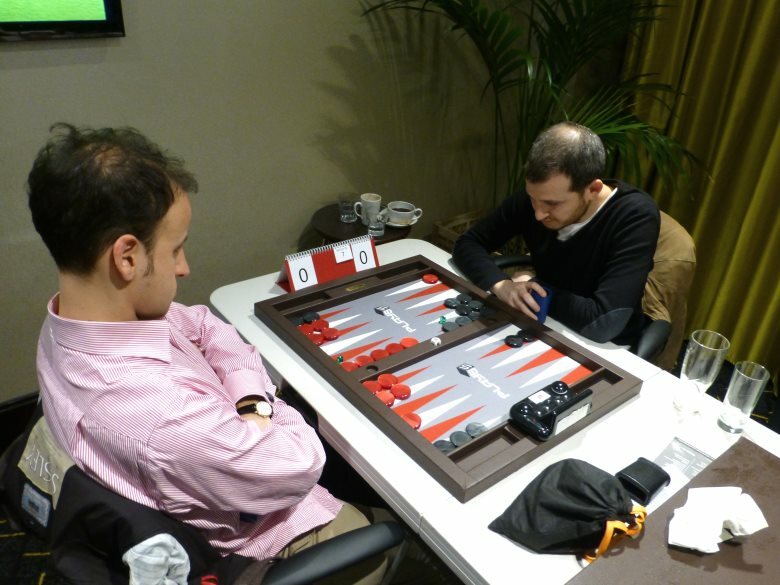 A little while later, Simon was sitting down to play the final against Antonio Sgambato, who had beaten Raj Jansari in the other semi. Unfortunately I don’t have any positions from the final match between Simon and Antonio. I can tell you that Antonio, when trailing 2-4 and realising that he was playing a very strong opponent, cubed in a position which was an easy take for Simon. Unfortunately for Antonio, it was Simon who won a gammon in that game to take the match. Congratulations to Simon who bags the second UK Open qualifier seat. Commiserations and thanks to all the players who entered the tournament, especially to Antonio, Jason and Raj who got close but not close enough. At least there are several more opportunities for you to win a seat in this series of qualifiers. The next stop on the Grosvenor tour is at the Manchester Disbury Casino on Saturday 15th March. Contact john@ukbgf.com to reserve your place. I love to hear stories about good sportsmanship like the one about correcting a poor illegal move, but I would much rather hear stories about how the rules are very clear to everyone so that a player is not put into an ethical quandary when things like this happen. Most of the world is adopting Legal Moves, which I strongly prefer for a long, long list of reasons. And the rule clearly states that it is the responsibility of BOTH parties to correct illegal moves when they see it. Yes, of course someone who is unethical can decide to pretend not to notice if it is to his benefit not to notice, but that is called cheating and if a player does this very often, it is going to be a badge he will wear and everyone will be careful with the person and hopefully, the Director will assign a proctor who will watch for illegal moves or any unsportsmanlike conduct and penalize the offender. It is also possible to cheat easily when you don’t play with Legal Moves. And without Legal Moves, there are all kinds of other problems and ethical dilemmas that have plagued tournaments for years. So, let’s stop these kinds of problems. Step 1: adopt a good set of rules that are fair and not ambiguous; Step 2: post them and make them available at every tournament, and if you have rule changes or new rules, like Legal Moves, make an announcement or two about it to alert everyone; Step 3: stop making and enforcing rules that are designed to try to protect us from cheaters, because there are very few cheaters and we can deal with them separately and harshly, and those kinds of rules make the game less enjoyable for everyone else.